The heather strewn romantic, and equally bleak, summit of Mow Cop (the name formerly spealt Mole and Mael, which expressed bald, while Cop, signified peak; now pronounced ‘Mow’ as in rhyming with ‘cow’) is a rocky hill nearly 1,100 feet high with a ‘mock’ ruined castle on top built in 1754. As part of the south-westernmost ridge of the Pennine range, the landmark straddles the Cheshire-Staffordshire border offering splendid unrivaled panoramic views of the surrounding countryside; the five shires of Cheshire, Staffordshire, Debryshire, Shropshire and Lancashire. Come on a spotlessly clear and sunny day, and you will find that by standing on the top of the hill provides a spectacular vista extending as far westward as the the mountain ranges of Snowdonia. Contrary to today’s perception of the ‘folly’, it was actually Primitive Methodism that put Mow Cop on the map long before visitors began to flock to the National Trust site. 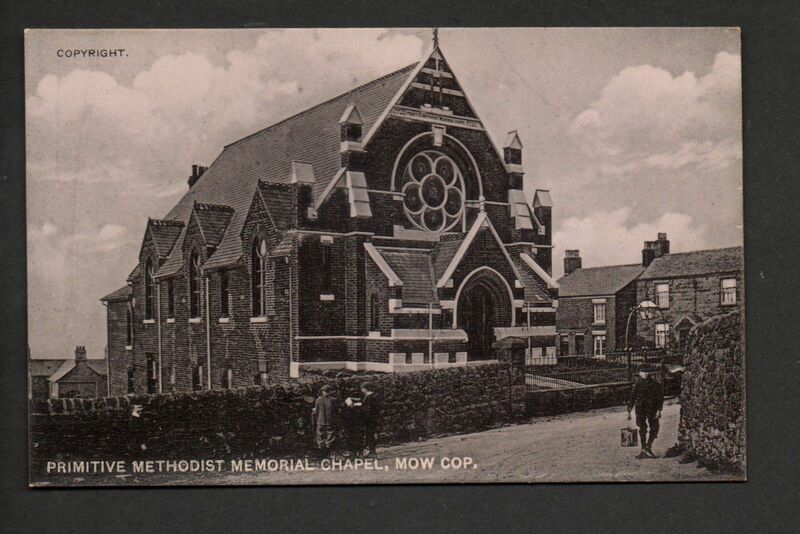 From 1807, Mow Cop was involved in the very beginnings of Primitive Methodism. On 31 May 1807, a group of revivalists, led by local wheelwright, Hugh Bourne, staged England’s first ‘camp meeting’ here on the Cheshire side of the ridge in a field at School Farm. This was the seed of the first English Camp Meeting. People from up and down the country were drawn to this sort of new Christian Mecca. On a glorious sunny day full of promise a congregation in its thousands, some travelling day and night, partook of fellowship in a day of preaching and prayer. With heaps of stones serving as elevated pulpits the growing crowds began to experience the manifest power of God close at hand. Thus open air services or ‘camp meetings’ were introduced. The picture is of the ‘rock’ pulpit monument, standing on the National Trust site just below the ‘folly’ erected to commemorate the Primitive Methodist heritage of this hillside.